Usually the Primary Care Provider (PCP, or a doctor, nurse practitioner or physician's assistant) interviews family about the kinds of memory or other cognitive problems a patient is having. The PCP may do some brief cognitive testing and order a blood test to examine for reversible dementia's like hypothyroidism or vitamin B12 deficiency. The American Neurological Association (ANA) recommends that oversight of any dementia assessment be done by the PCP; although, the PCP will often refer the patient to a specialist in neurology, psychiatry and/or psychology to consult and perform a more in-depth assessment. The consultant typically administers neuropsychological measures of memory, language, reasoning and other neurocognitive functions. Ideally, of course, the consultant is a specialist knowledgeable about psychological functions in seniors. These include Behavioral Neurologists, Geriatric Psychiatrists, Neuropsychologists and Geropsychologists. There are generalists who may also become involved such as a geriatrician; i.e., a physician who specializes in the care of older adults). Or, a gerontologist; generally, a non-medical professional working with seniors, like a geriatric social worker or recreation therapist. Neuropsychological testing can be done in the doctor's office, but a home-based assessment is ideal for senior citizens who have difficulty traveling. In addition, it is useful to see the individual in their home setting in order to offer recommendations about independence and functional capacity. Medications can be checked for accuracy, as the pill bottles in the home often do not correspond to the list the patient takes in to show the doctor. This author often searches, with the patient's permission, for over-the-counter (OTC) drugs and supplements in the medicine chest or on the bedside table, that can cause memory difficulty. People do not consider these "drugs" (they are) and there are dozens' of OTC remedies tied to worsening or even causing dementia. A typical evaluation takes about 3-4 hours face-to-face contact with the patient and family. At the Memory & Attention Center, we spend an entire morning or afternoon with the patient and family. A care provider or family member should be available to provide history if the patient is not capable of doing so, alone. Feedback at the end of the testing will be provided to the patient and family, as appropriate. Bring all medications, over-the-counter (OTC) drugs and remedies, sleep aides, pain killers, supplements, and vitamins to the evaluation. NO LISTs. Bring the bottles in a bag. Bring your eyeglasses and put in your hearing aides. Bring your insurance information (all cards) if you wish it billed on your behalf. Bring any previous medical or psychological reports that you have. For a home visit, please have all this ready and waiting for us. Kindly have the patient's hearing aides installed and eye glasses available. Finally, bring all medications, over-the-counter (OTC) drugs and remedies, sleep aides, pain killers, supplements, and vitamins to the evaluation with you. NO LISTs. BRING THE BOTTLES–just put them in a big bag. These are the things your doctor would never know you are taking, and supplements are all "drugs" that are sold with little or no government oversight as to quality and harmfulness. See more at the section in this website on Supplements. We'll want to see anything and everything you put in your body that is not food, and we'll review this in depth and together. Count on this: Dr. Elovitz and his colleagues will not arrive exactly on time. He often drives an hour between appointments and must handle emergencies as they come up. There is traffic on Cape Cod! Expect him to arrive within ± half an hour of a morning appointment time. Expect him to arrive within arrive ± 1 hour around an afternoon appointment time. Sears Roebuck wants a 4-hour window to deliver a refrigerator, so please give us a break and don't call Craig five minutes after your estimated appointment wondering where he is. He will be either early or late, but never on time! We'll call you if we are falling outside of the ±half hour in the morning and ±one hour time window in the afternoon. PLEASE NOTE: He is just as likely to arrive early as late, so don't run out for a quick errand or to get a coffee–please be at the appointment site at least one hour ahead of your scheduled time. He has no shows (patients forget the appointment despite our reminder calls), and thus he may call you to see if he can show up several hours early if his morning patient was missing or untestable. Be ready for anything, just reserve the day. Also, remember there is a no show fee as we lose half a work day if the appointment is not cancelled, for any reason, 24 hours or more in advance (see the next section about this). Note appointment times vary based on each patient's speed and case complexity. Once in your home expect the visit to last 2.5 to 3 hours. We will not be going to your living room to sit and chat. We need a table to sit at to manage tons of paperwork, not a coffee table, a kitchen or dining room table with a clear space an one end is perfect. We don't need fancy; i.e., a card table or folding TV table can make do if that is what you have or the patient can’t move from his/her easy chair. Husband, wives, sons, daughters, in-laws are all welcome if they are involved with the patient. We start by taking a history and problem statement, then test, then provide feedback to the patient and family. A seven page report than follows in about two weeks. Please have a chairs for everyone who participates so we can talk comfortably before and after the evaluation. The diagnostician will ask for two (2) chairs, one for themself and one for their big bag of test materials, to keep them easy to reach. If the patient can not move from an easy chair or hospital bed, a folding tray table and chair should suffice. We carry a folding stool with us as we see many homes with "hoarding" to the point of no place to sit or even put down a piece of paper. If the dining room table is covered with paperwork, all we need is to clear a corner for the testing materials to be displayed. Don't be embarrassed, we are not the neatness police, we are only coming to your home to help–not to judge. Do I prepare my Parent? Ideally, no. If the patient does not perceive any memory problem in him/herself (and they think you are fussing too much), please don’t say anything. You explanations will fuel suspicions that can even turn to mild paranoia, spoiling the testing session before we even arrive. As we typically have a doctor’s referral, we just say we’re here at Doctor’s so-and-so’s request. The diagnostician will introduce him/herself and say we’re here to assess your memory as we do for many, many seniors. We do this because there are treatments (like vitamins and exercise) that can help prevent them from getting worse. That suffices in 99% of cases to make folks cooperative, especially since we treat everyone with (exaggerated) courtesy. If the patient does worry about a memory problem, than you can briefly mention someone is coming at their doctor’s request to “check out their noodle.” The less you say the better. HIPAA rules will cause the diagnostician to have to go silent every time a teenager enters the kitchen to make a sandwich, so kindly arrange for them to not be present. Also, please do not schedule repairmen, or landscapers on the same day as the distraction from them coming in and out, or the noise, will negatively affect the testing. Leaf blowers are our worst problem in warm weather, they will destroy the validity of anyone’s test results as none of us can hear. Remember, we are trying to create a professional office in your home, and doctors don't have workmen walking in or out of their exam rooms, which are sound proofed with no phones present. This is the ideal time to not babysit the grandchildren; all adult children, spouse or even close friends of a patient are welcome at the session, if the patient approves. Exactly what happens in the house? Dr. Elovitz or his associate (a diagnostician) will try to replicate his office (which is soundproofed and private) inside your home and treat this as a professional visit. We’ll ask you to turn off the TV and radio and unplug the phone. Also, since we are working and wearing business clothes, kindly close the windows and turn on the AC, it avoids wind blowing papers around and allow us stay cool enough concentrate. If you don’t have AC, we’ll cope with it–but let’s use it if you do! You do not have to entertain us. Please: no coffee, tea, hors d'oeuvres, coffee cake, water–no nothing. We know you may want to be kind and solicitous to your parent, but please no soda, water, coffee or tea for the patient as it winds up getting spilled on our expensive testing materials every 3rd or 4th visit. That can shut down the assessment, and remember it may take months for another appointment. Everyone can go for a while without a big glass/bottle of water at hand–and, we take frequent bathroom breaks during which we can get the patient a drink. Remember, Dr. Elovitz and most of his colleagues are getting older themselves and also need frequent access to the bathroom! Kindly lock up dogs that jump (this includes "service" dogs, friendly dogs, "he just likes everyone dogs," etc.) as Dr. Elovitz has tired of replacing many pairs of pants and treating dog nail scratches. Yes he loves dogs, but dogs jumping on you every day becomes a drag, after 40 years of doing this, and being rather old himself he often gets knocked down by large jumping animals. He’s even been knocked over by a big cat. Ugh! Not a good way to start. Lock up dogs before we arrive and as most excited dogs will eventually relax, you can let them out after a few minutes once the diagnostician is safely seated. If you have constantly barking dogs (or a hyperverbal parrot) please make an appointment for an office visit. Also, if grandchildren, babies, or toddler are going to be present, please arrange to have a baby sitter, ideally elsewhere or at least in another room, so we can all concentrate. We cannot test a person who is also babysitting their grandchildren at the same time. It is very difficult to spend an hour or two providing feedback and guidance to a patient's daughter with a baby on her lap. We love kids, just not during a professional evaluation. You wouldn't bring them in to your doctor's exam room, and that's what we are trying to emulate in your home when we visit. Most important, we will need to temporarily disconnect land line phones and turn off all cell phones. Phones ringing, the answering machine doing its thing, and the cognitively impaired patient’s powerful need to answer–usually junk–calls (it could be a sweepstake's winning call!) will ruin the testing and, remember, the next appointment could be nine months off. Kindly have the patient's hearing aides installed and find his/her eye glasses and have them available. We carry hearing aides with us, if needed. Keep any previous medical or psychological reports that you have handy, as we can review them during our visit. Finally, have all medications, over-the-counter (OTC) drugs and remedies, sleep aides, pain killers, supplements and vitamins on and on the table. No lists, we need to see the actual bottles to verify them–this is a big reason we do home visits. Also, have any pill box or dispenser handy, as we tend to count the pills to check for accurate compliance. 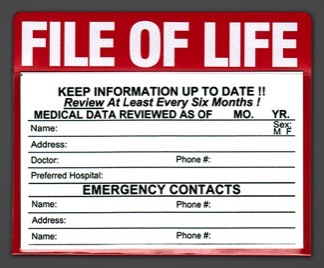 We’ll look for your File of Life (FoL) which is a red plastic magnetized pouch visibly attached to your refrigerator–one for each senior in the house. On at least three occasions Dr. Elovitz has found his patient on the floor having fallen while waiting for him. He calls the local rescue squad and then stands by. Here’s what he has seen: Rescue personnel arrive, drop off their tackle boxes of equipment, step over the body on the living room floor and go straight to the refrigerator. If they find the FoL, they review it and start treatment. If they do not find a FoL listing medications and physical ailments, they can do nothing more than start oxygen. Without a FoL, they can not know if a patient is on Coumadin (warfarin) for atrial fibrillation? Intubating such a patient could cause them to bleed out. You can get an FoL at most fire departments and at your local Council on Aging (COA-often called incorrectly referred to as a “Senior Center”) program, or order it on line. Fill out your medications in pencil (so you can change them) and date it each time you modify it! An undated contract or FoL is worthless. Other issues: We want to see bright lights everywhere, this is not a place to conserve energy in a senior's home using dim low wattage lights or those squiggle replacement bulbs. 50% of people over 60 are dead within one year of a fall. They survive the hip fracture surgery, but then catch MRSA in the rehab center, or become de-conditioned by being confined to a wheel chair and thus become a target for pneumonia, more falls, etc. Tape down with double faced sticky tape all carpets and throw rugs, or better yet get rid of them. If you allow it, we’ll go through the house with you looking for these and other risk factors.